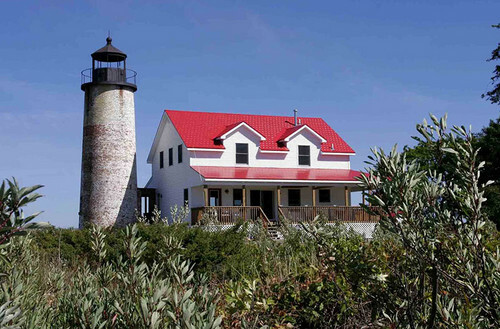 Built in 1856-57 it was originally equipped with a white, Fourth Order Fresnel lens. Fourth order Fresnel lenses were 28", with a focal length of 9.8", and used 5 ounces of oil per hour. Although a lens in that configuration had a range of up to 15 nautical miles, the Charity Island lens had a range of 13 nautical miles. In 1900 the light was fully automated, an acetylene lens replaced the 4th order lens. It was deactivated in 1939 and replaced by the Gravelly Shoal light about 5 miles away.